When the original God of War launched on the Playstation 2 back in 2005, it was showered with praise from critics and turned into what seemed like an overnight classic, a pattern that repeated when God of War 2 was released in 2007. Fast forward three years and the trilogy of Kratos has come to a close, but has this final entry in the God of War series lived up to all the hype? Indeed it has. I’m glad that I am typing this, because my jaw is too sore from constantly dropping to say it. From the moment you pop your disc in and hover over the God of War 3 icon, something becomes very evident very quickly: the score is going to be thrilling and epic. Truthfully, experiencing a game’s soundtrack is rarely a memorable experience for me. Sure, a well orchestrated score may add a lot of depth and enjoyment to a game I already like, but with a few exceptions, I’ve never found myself humming the tune of a song I heard in a videogame. This is not the case with God of War 3’s score. Even after the intensity has faded from a battle, I find myself still breathing heavily as my heart beats faster and faster, and even after turning my Playstation off, I still find the tunes of each track stuck in my head, unable to be suppressed even if I wanted to do so. Furthermore, God of War 3 features a broad range of vocal talent, including the return of Terrence Carson as Kratos and Corey Burton as Zeus, along with some warmly welcomed newcomers to the franchise, such as Kevin Sorbo who provides the voice of Hercules in-game and Rip Torn who voices Hephaestus. While Zeus does sound somewhat different at first, his voice falls back into complete recognizability quickly. As for the events of the climactic finale, the story itself, things are mostly pretty standard as far as God of War goes. 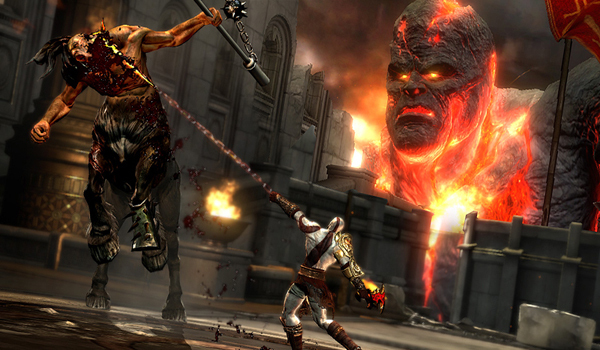 Kratos is still on a revenge trip, and he is going to brutally disembowel and break anything in his way. He will also confront demons from his past through very brief flashback sequences. What’s truly remarkable on the story side of this latest entry in the series are the characters themselves. 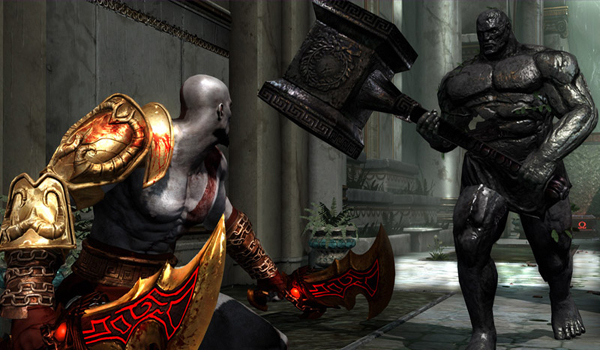 Where God of War and God of War 2 seemed to almost isolate Kratos as the sole figure with any sort of motivation or personality, God of War 3 attempts to flesh out and intertwine the destinies, emotions, and motives of a varying range of characters, most notably Hephaestus, Pandora, Zeus, and Kratos himself. Of course, there is more to it than that, but in the interest of sparing you any major spoilers, I’ll say only this; it’s refreshing to see a fairly cohesive story, if not an excuse to craft havoc and leave a trail of corpses in your wake, that manages to connect such a large cast of characters, casting each in their own important role without deemphasizing the game play or the main conflict. The game ends on a note that is both suitable and predictable. That is to say, it’s no surprise that it ends in the way it does, and it is an appropriate way to end the trilogy of Kratos. At the very least, it is not some ham-fisted attempt at a shocking plot twist. This game is also an exercise in non-intrusive cinematic scope and visual fidelity that goes nearly unrivaled on current generation consoles. The music in God of War has always been at least fairly epic, the story continues on from God of War 2 and expands somewhat, the game play introduces a few new mechanics, but mostly sticks with the tried and true formula, but the graphics have really undergone a significant transformation. For starters, textures finally “pop out” at you. 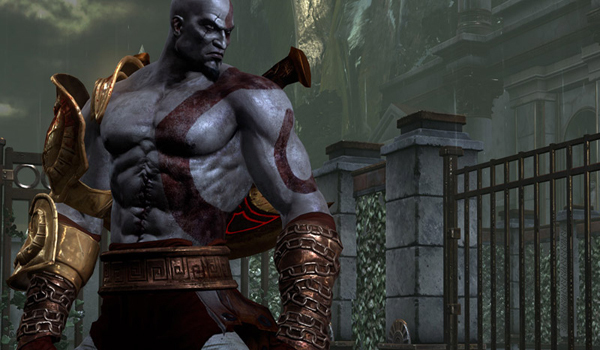 The chains on Kratos’ wrists no longer look like they were painted on, and his muscles and bulging pectorals look as though they are actually deep. Everything is crisp and beautiful, bringing the hyper violent action alive in gruesomely gorgeous detail – from flesh, tendons, and ligaments tearing as heads are ripped off of the bodies they occupy, to the reptilian sheen of a scaly gorgon hide, to Kratos himself turning a pale purple-pink color as he is painted with the blood of his enemies. As far as the scale of the game goes, the vistas, the bosses, the sheer proportions of everything are, and excuse the pun, titanic. Never before has a colossal scale like this been achieved with so much resounding success. What looks like epic scenery isn’t just scenery – it’s a titan scaling Mount Olympus in the background as struggle to stay atop another titan, and then you realize that the other titan is swatting at you with his colossal hand, just as we would swat at flies. With words such as epic being so overused nowadays, it’s difficult for words to adequately convey the impressive scale of this game. I rarely feel so much jaw-dropping excitement from just watching something unfold, let alone actually playing it. The next sentence may come as a very slight spoiler, so be wary. This concept of colossal scale is epitomized in the battle against Cronos; a one-on-one (kind of) standoff against a titan. Whereas with most enemies Kratos would be pummeling their faces in, he struggles in this fight just to rip a single fingernail off of the ancient titan. The battle against Cronos is sure to go down as one of the most epic boss fights in video games. Even for such a colossal and chaotic thrill-ride of a game, the pacing never falters, the game will never overwhelm you with ‘too much’ action. Interspersed with the combat are platforming sequences, brief cut scenes, puzzles of varying difficulty and complexity, and my personal favorites, a few portions of the game involving exclusively the use of the Icarus Wings in short flight sequences. These are all staple elements of the God of War series, and Sony Santa Monica subscribes to the “if it ain’t broke, don’t fix it” philosophy. The gameplay is by and large more of the same, but that isn’t a bad thing. It worked very well for the first two games; there was no need to overhaul things just for the sake of innovation. Of course, that doesn’t mean the game hasn’t been further polished, and that there is not a single additional mechanic added. To the contrary, the battering ram, where you grab an enemy and use him to plow through a group is a welcome and fun addition, as is combat grappling which allows you to pull enemies to you ala Scorpion from Mortal Kombat. One of the most significant additions to the game play is the item meter. It’s a 3rd yellow bar beneath your magic bar which replenishes quickly and automatically, and dictates how many attacks you can perform with a given item, such as Apollo’s Bow or Hermes’ Sandals. Since it is quick to regenerate in combat, you rely less and less upon your magic meter, allowing you access to a greater repertoire of abilities while fighting instead of forcing you to play it safe with your abilities lest you run out of magic at a crucial moment. The new positioning for button prompt sequences, with the prompts occupying the periphery of the screen, was awkward at first, as the first two games had acclimated me to looking for the buttons in the center of the screen. After some adjustment, however, it is clear this is a vast improvement as the buttons no longer interfere with your view of the action on screen, and it’s actually a rather intuitive system in and of itself. But is all of that reason enough to keep the game on your shelf or just rent it? The fun factor alone is enough of a reason, personally, to keep the game around and play through it multiple times. After spending 12 hours on my first playthrough on hard, I still hadn’t attained roughly 40% of the trophies available. Furthermore, there are, like in the previous game, bonus items which can be activated on subsequent playthroughs, along with a “challenge” mode featuring numerous difficult challenges. 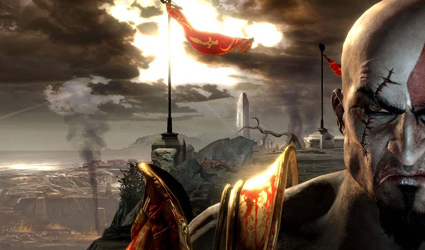 Finally, there is an additional game mode in God of War 3 known as the combat arena in which you select waves of enemies with the singular purpose of testing your own limits in the arena. It may not be terribly deep, but it is certainly fun. God of War 3 doesn’t need these gimmicks to keep you coming back, but they are welcomed supplementary game modes. God of War 3 is hands down one of the single most compelling reasons to own a Playstation 3, and is an incredible experience that no gamer should miss out on unless your constitution is too weak to handle something this violent and gory. On all counts, God of War 3 is as close to flawless as they come, adding and improving where improvements were needed, and not overhauling game play elements that worked fine in the first place. Take the fluid and visceral combat, along with the knack for weaving known Greek mythology into a distinct yet interesting story of revenge, and some fantastically imaginative bosses from the first two games, and infuse in them a spectacular cinematic experience and you have God of War 3, the final installment in a series that made evisceration an art form. It’s vivid, thrilling, and bloody awesome.